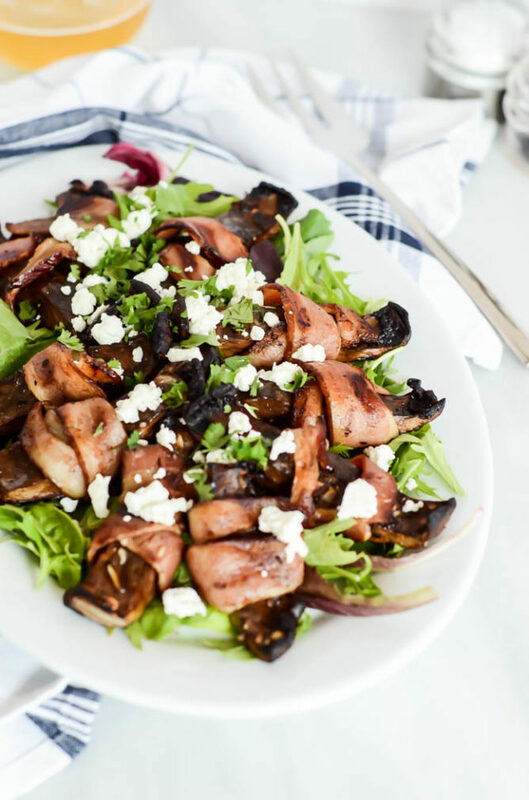 But really, if you’re trying to sneak in any sort of salad/light-ish side dish for your Father’s Day cookout this weekend, these Bacon-Wrapped Portobello Mushrooms with Goat Cheese are the answer. I mean, whose Dad doesn’t like bacon? And bacon isn’t all you get here. 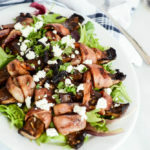 Prepare yourself for an explosion of garlic-laced balsamic flavor, meaty mushrooms and a sprinkling of tangy goat cheese. Serve it all over a bed of greens (I’m partial to something involving arugula) and the dish passes as a salad that the dudes will even be helping themselves to seconds of. To start, I used the same marinade that I use for my Balsamic-Marinated Stuffed Portobello Mushrooms. I love marinating veggies because they only need 30 minutes MAX before they’re ready to go. No waiting hours (or worse, overnight!) for them to be ready for the grill. While the mushrooms are marinating, you’ll partially cook the bacon in the oven. Because mushrooms don’t take too long to grill up, we need to give the bacon a little head start. The partially cooked bacon gets wrapped around our sufficiently marinated Portobello’s, then we fire up the grill! Once we have the mushrooms on the grill, this dish will be ready in a flash. 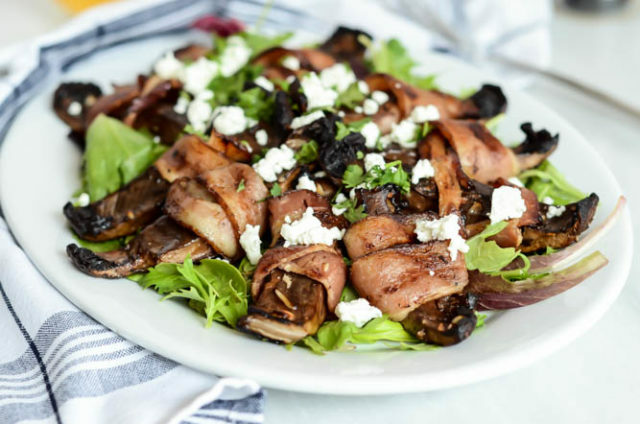 The ‘shrooms will only need about 5-6 minutes on each side to cook (hence, why we precooked the bacon,) then we let them cool slightly, lay them over the bed of greens and sprinkle with that crumbly goat cheese. That’s it! And because there’s so much flavor packed into the Portobello’s, you really don’t even need a separate dressing. 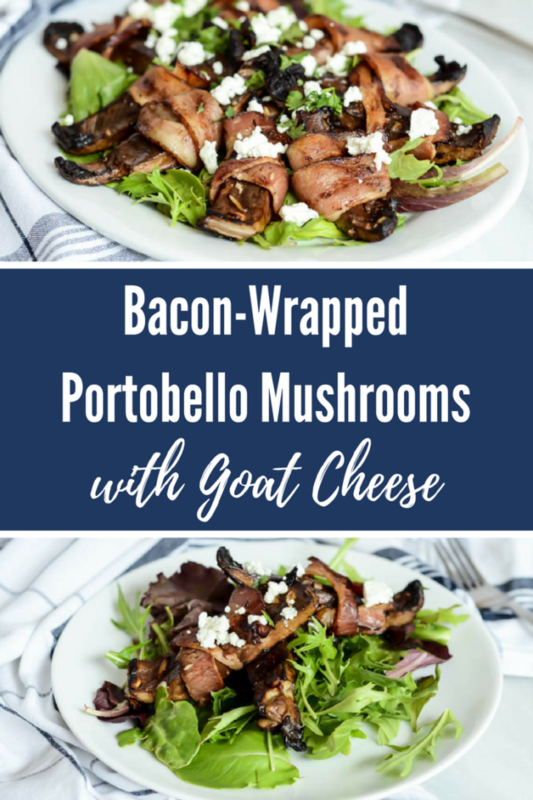 I don’t know about you, but the thought of having some of these Bacon-Wrapped Portobello Mushrooms with Goat Cheese with all of the other delicious food we’ll be eating this weekend has me REAL excited for our trip up to our parents’. In fact, I’m taking a tip from my gal Lee over at Fit Foodie Finds and hustling to get all my work done by end-of-day Thursday so I can take Friday off and spend it getting ready for our little road trip north later that afternoon. Anyone else here whose self-employed agree that every summer work week should only be four days?? Let’s start a movement! I’m hoping it helps me be more productive during the week if I have more strict guidelines of when I need to get things done by. The extra hours of sunlight don’t hurt either so I can get more photography done during the day! 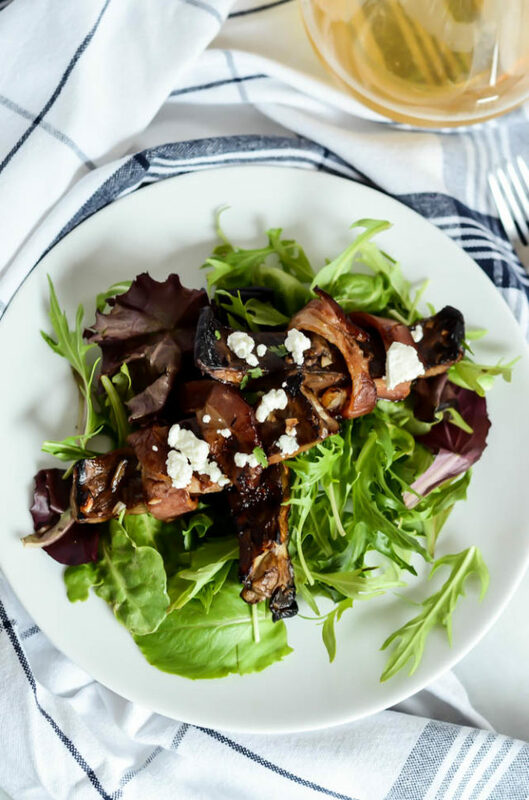 Okay, but seriously, even if you’re not doing anything special this weekend, or if you want a quick, healthy meal to get you through the rest of this week, I highly recommend you get about making these Bacon-Wrapped Portobello Mushrooms with Goat Cheese. Here’s to getting through the rest of the work week with delicious food on the horizon!! Marinated Portobello mushrooms wrapped in bacon and topped with crumbly goat cheese. A hearty, delicious salad that even the guys in your life will love! 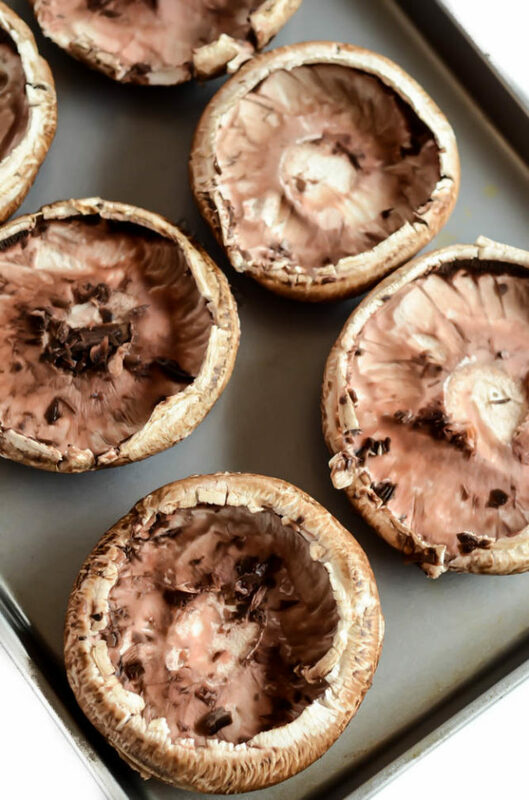 Place the mushrooms in a resealable plastic bag with garlic, olive oil, vinegar, salt and pepper. Make sure the mushrooms are evenly coated with the marinade and place in the refrigerator for 30 minutes. While the mushrooms are marinating, partially cook the bacon. Lay the bacon out on a large jelly roll pan line with aluminum foil. Place the pan in the oven and turn the oven on to 450 degrees Fahrenheit (so you will not be preheating the oven, it will preheat while the bacon is already inside.) Set the timer for 15 minutes. Remove the bacon from the oven and let cool slightly, then cut each piece in half lengthwise. Remove the mushrooms from the refrigerator and wrap each one with a piece of the partially cooked bacon. Heat your gas grill to medium, then put on the bacon-wrapped mushrooms spears. Cook for about 5-6 minutes per side, or until the bacon is sufficiently cooked. Be careful when working the grill as the grease from the bacon may cause flare-ups. Place cooked mushrooms spears over a bed of mixed greens and sprinkle with goat cheese, to serve.